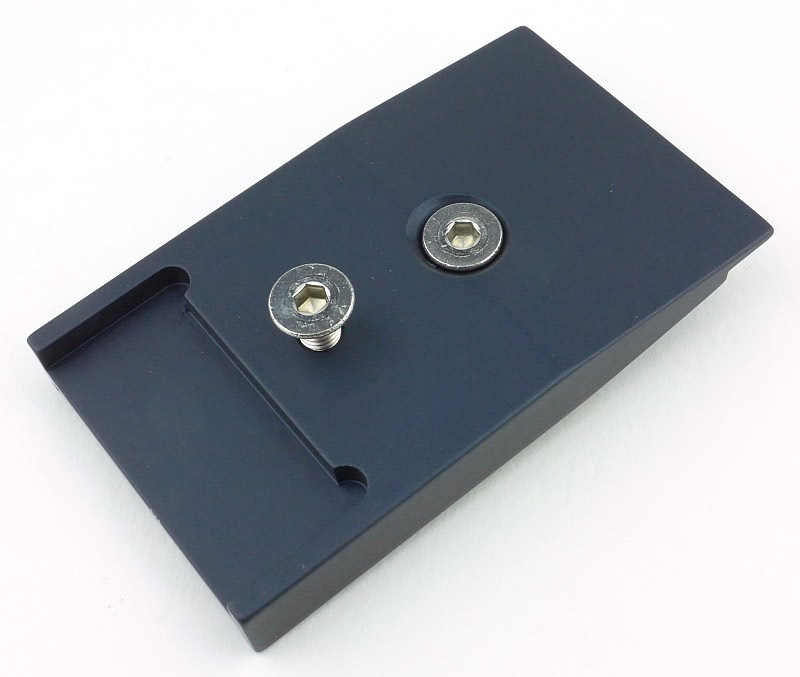 This is a supplementary review to the Wicked Edge ‘Field and Sport’ Sharpener Review as it covers two optional extras that extend the functionality of a Wicked Edge Sharpener. The Low angle adapter has been around for some time, but the Advanced alignment guide is a recent addition which further enhances the precision of the sharpener. 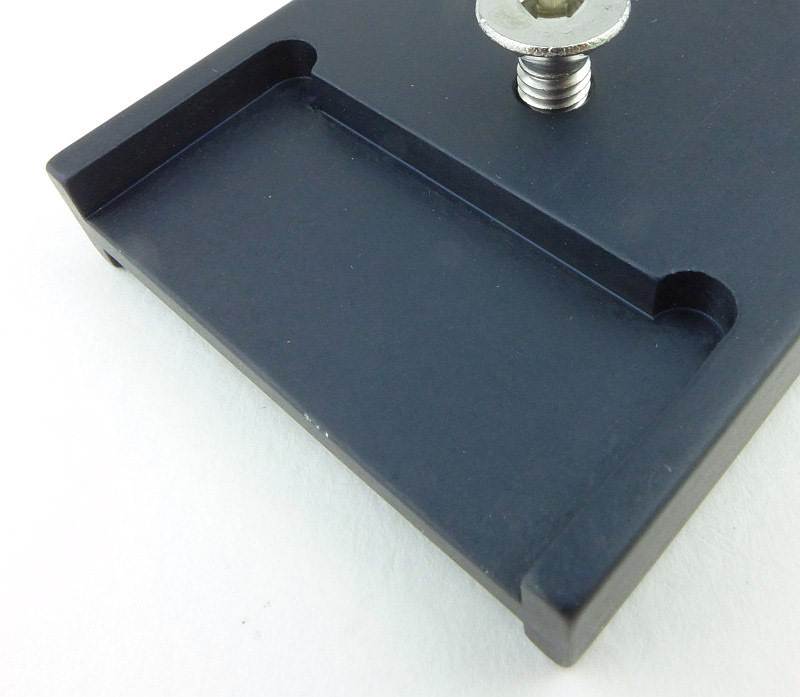 The Low Angle Adapter is a clamp extension for a Wicked Edge sharpener which allows for angles as low as 10°. 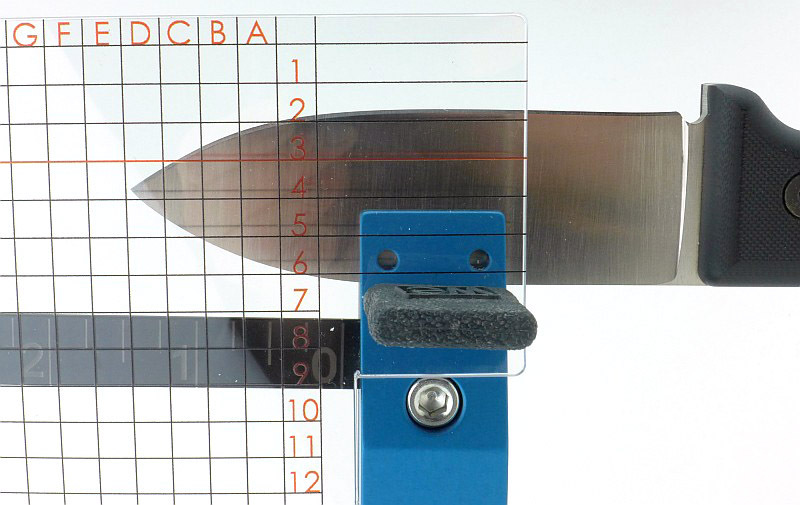 The Advanced Alignment Guide provides measurable reference points for repeatable knife mounting. 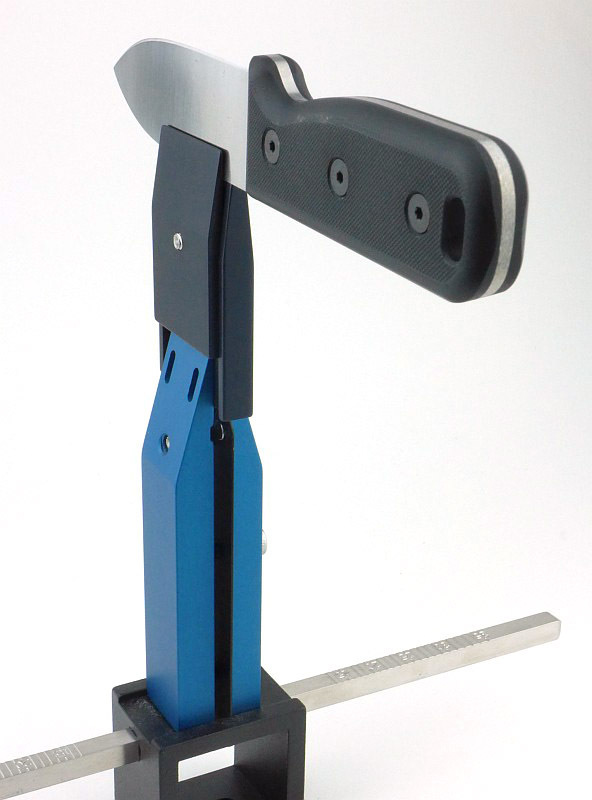 It allows a Wicked Edge user to be able to tilt a knife in the clamp to find the optimum knife positioning and record the setting so the mounting position can be repeated during the next sharpening session. For this supplementary review it makes more sense to combine the different sections I normally use, so we will look at each of these optional extras and how to use them at the same time. 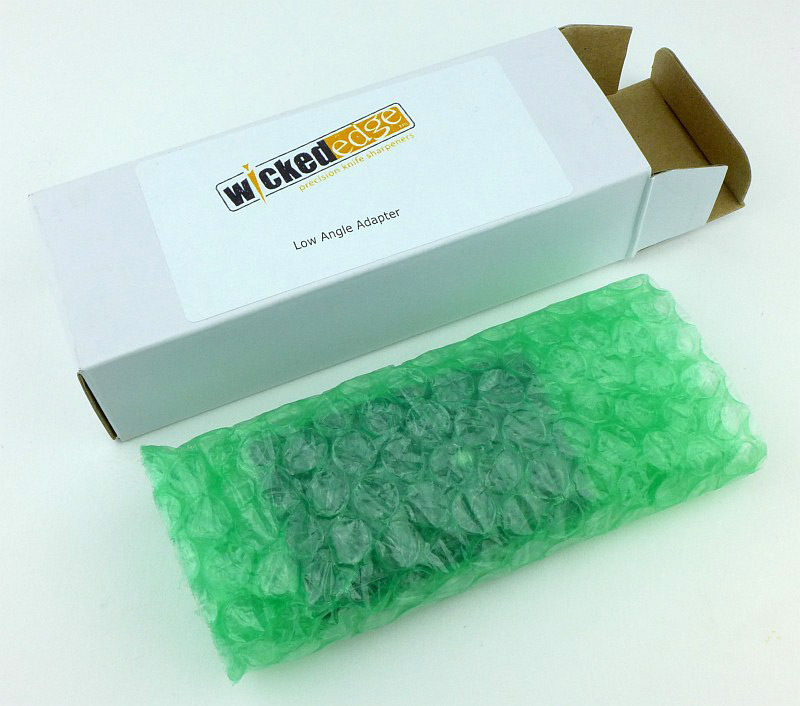 Unpacking the low angle adapter. 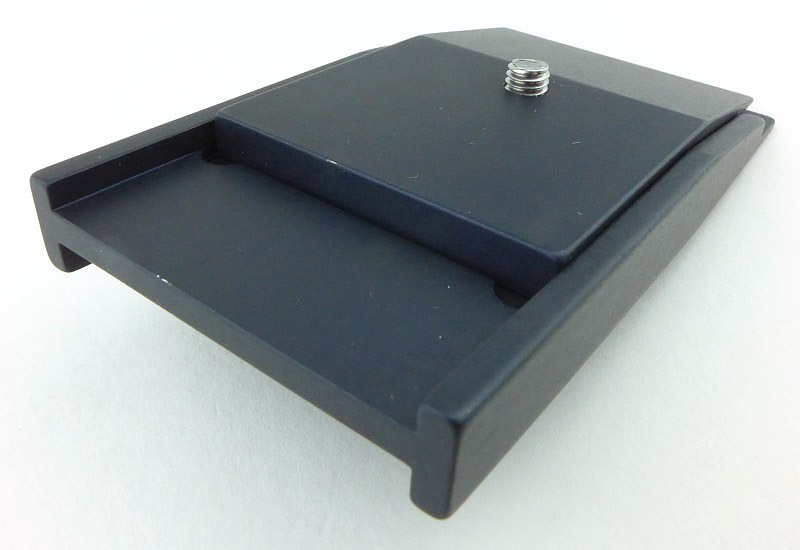 The main body of this clamp extension is black anodised aluminium. An area is milled out of the adapter for the sharpener’s standard clamp jaws to slide into and grip. 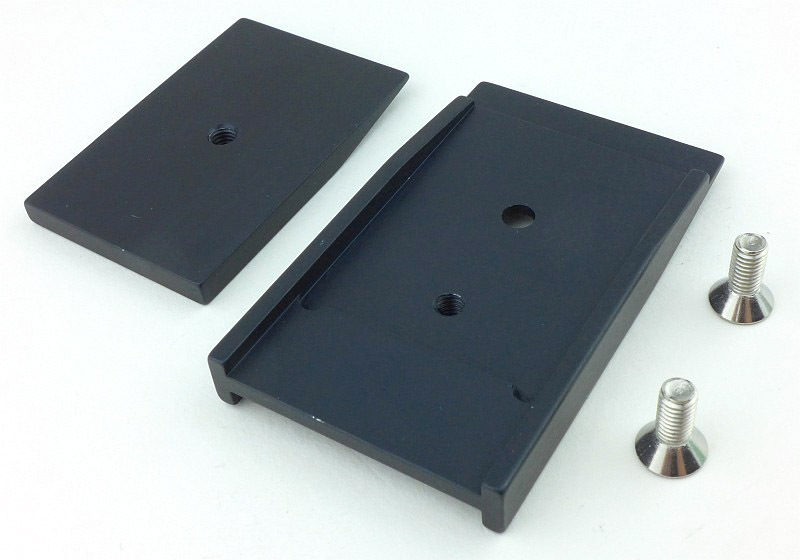 The other side has a different profile as there is the adapters blade clamp plate. Taking this blade clamp completely off shows the milled pocket into which it sits. The milled out areas on each side (for the sharpener’s clamp and the adapter’s blade clamp) ensure precise alignment of all parts of the adapter during use. To clearly illustrate what this low angle adapter does, here is the standard clamp of the Wicked Edge, and at the low angle set for the stone, the stone is hitting the clamp jaw, so won’t reach the knife edge (unless the knife is very deep). With the guide rod at the same angle, fitting the low angle adapter allows the stone to completely clear the main clamp and work on a knife blade fitted into the adapter. 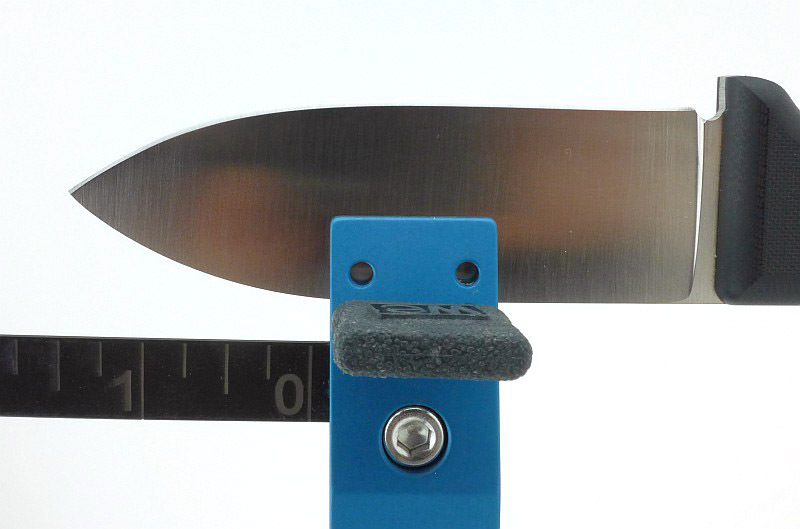 All standard angles are still available even with the low angle adapter, but remember the scale on the main clamp will now not be exactly correct as the height of the blade has changed. Make sure you note down the fact the that adapter was used along with the angle shown on the scale for the guide rod. With the Wicked Edge system you note down the various settings used for each blade so that in subsequent sharpening sessions you can repeat the angles precisely, reducing the amount of metal removed. 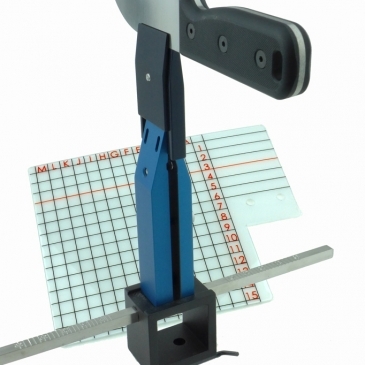 The Advanced Alignment Guide gives you a further level of precision for the positioning of the blade in the clamp, and allows you to angle the blade and record the exact position you used. 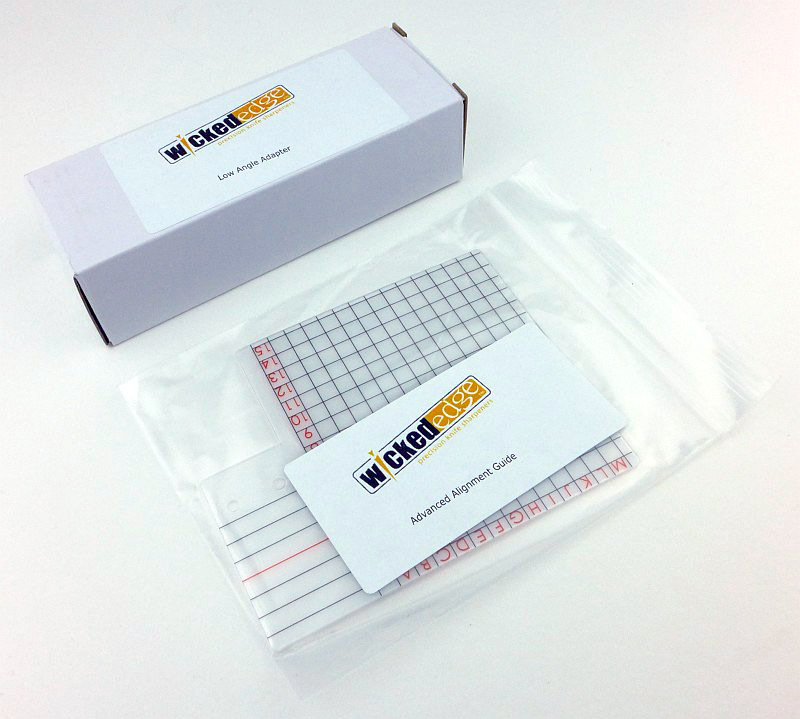 When it arrives, the guide has a protective film to ensure you get it completely free of marks. 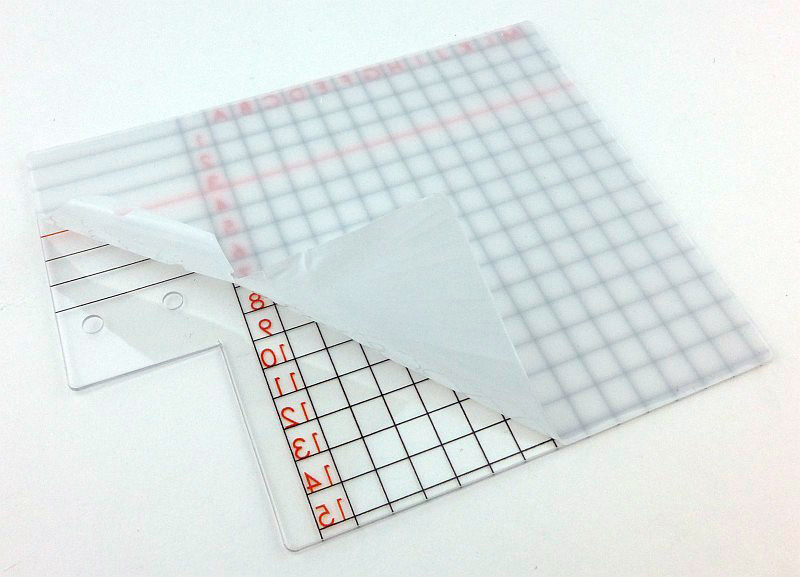 With the protective film removed you can see the grid printed onto the guide and two holes which are used to fit the guide to your sharpener. 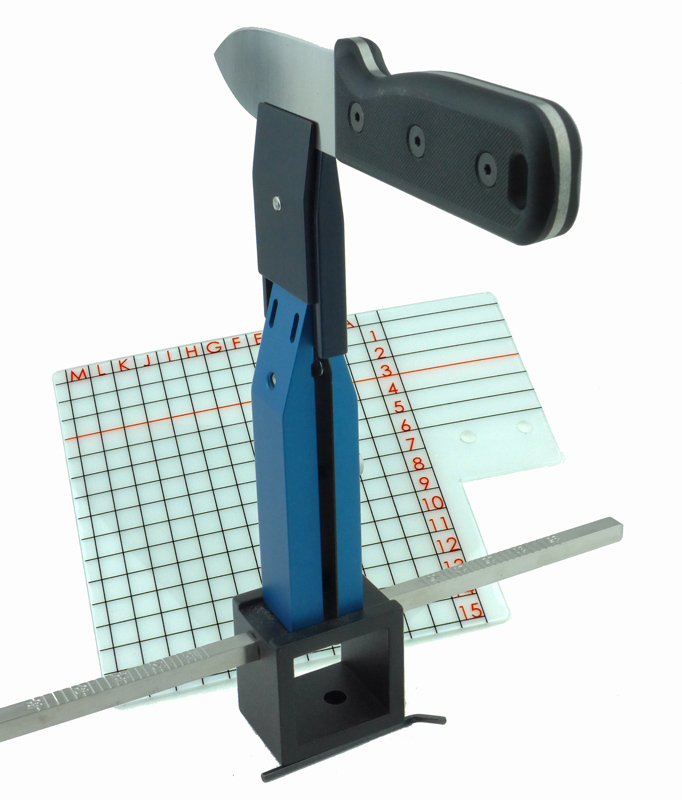 Before this alignment guide was made, you had to use the simple ruler scale built into the clamp to position the blade, relying on the blade spine to sit squarely onto the depth key. To use the new guide, when you fit the two pronged depth key into the clamp, first pass the prongs through the holes in the alignment guide and then into the clamp. 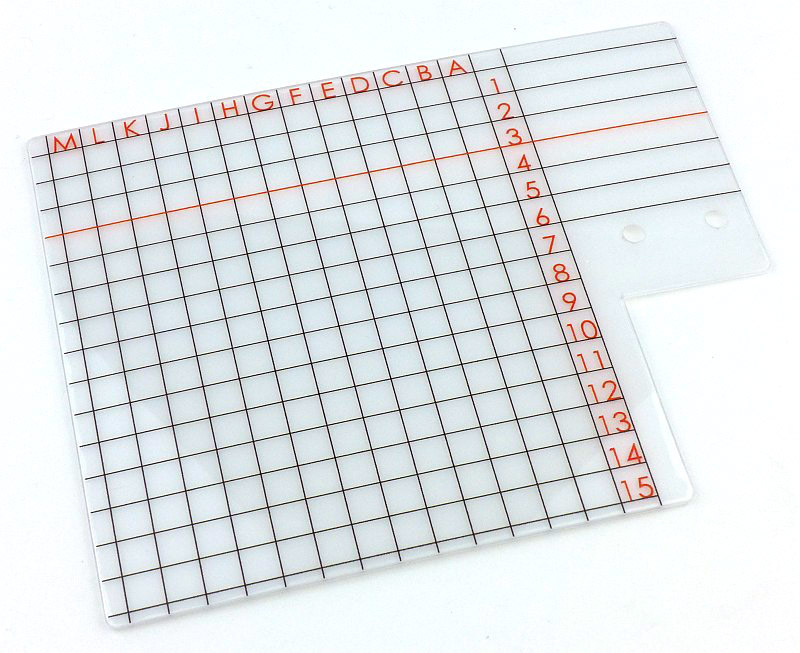 Now you have a 2D labelled grid which allows you to precisely position and record where the blade tip is set. This also means you no longer have to put the blade spine down onto both depth key prongs and can rock it one way or the other to better present the knife edge for sharpening. Another level of precision. Finer Edge Angles available. Relatively expensive. Smaller blades can be sharpened. Blade positioning even more repeatable. Doesn’t sit against a flat surface so can move backwards and forwards. Much easier than the standard ruler.